Well, it’s that time of year when I feel the need to declutter stuff around the house and garage. Again. I actually helped a friend yesterday declutter stuff in her master bedroom closet. I don’t know about you, but if someone will just come and talk to me as I start pulling stuff out of closets, it’s a lot more fun. I had gone to breakfast with her and she mentioned how overwhelming it is to organize closets and cupboards, etc. I told her I would help her, then I went to pick up some zippered bags and called to see when we could get started. I brought my Minute Timer but we didn’t use it. We jumped in and started tossing, recycling, and boxed stuff to sell. I like to clean my house in 15-minute increments because then it makes me work faster as I hear the timer tick. 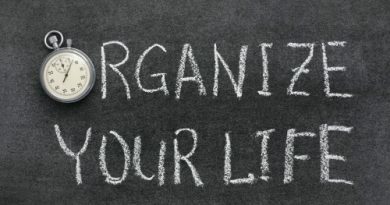 Anyone that knows me really well, understands my passion for organizing everything. I really think I am OCD and I own it. If my daughters mention a closet could use some organizing, I’m on it. They know I love cleaning out stuff and labeling everything. It’s probably a good thing I don’t live close to IKEA or The Container Store, I love those stores. I could browse in those departments with containers and organizers for hours. Let’s make this easy today, you can use 33-gallon clear bags for donating stuff, black bags for trash, or if you have some empty boxes you’ve saved for moving, just them and be sure to label them based on what’s inside. If the stuff you pull out of the closets, cupboards, drawers, or the clothes hanging up in closets are no longer useful or no longer give you joy, it’s time to let the stuff go. I promise you’ll feel calm and joy in your life with less. The biggest bonus you can give to yourself is letting go of clothes that someone else could use today, not ten years from now. If you haven’t worn them in three years, chances are you will never wear them again. I know, I can hear some people saying, “but this cost me $$$$,” but if you aren’t wearing it, why hang on to it? Has it been ten years since you wore it or used it? Is it a collector’s item, Or is it just clutter? Let’s keep the good stuff and let go of the rest. Maybe it’s my age, but I don’t want my daughters to have to go through useless stuff after I pass away. I know it’s hard to let go, I get it. My friend mentioned a quilt made by her grandmother was frayed on the edges, but she felt a sentimental attachment to it. You could tell it was a well-loved quilt. I told her I would help her “bind” the quilt another day. We put that special quilt in a zippered bag to protect it with love. These are the bags I buy, you can get them at Bed, Bath & Beyond or order them online. Sweater Bags and Quilt Bags. I used to buy those “vacuum bags” but they ended up not working out for me. They would pop open and split. Now, the kitchen “stuff” is a totally different ball game. I’m a kitchen gadget junkie, I confess. I love cooking, baking and trying new recipes, it’s my passion for life, I guess. Yes, I do have those cupboards organized pretty well. But I will organize them another day. Again to see if I can eliminate things that haven’t been put to use, no matter what the reason. Somethings the tuff decision is whether to throw the items away or give them away. My husband tells me that someone can put to use the things I don’t want or need. He likes taking things to organizations like Goodwill, or the Deseret Industries. He figures those folks know best what can be sold or placed elsewhere, so we drop them off and let the people there make the decision. Worst case, things like the clothes will be used to make scrap or rags. This is where you have to be ready to make a decision whether you can let go of stuff or not. 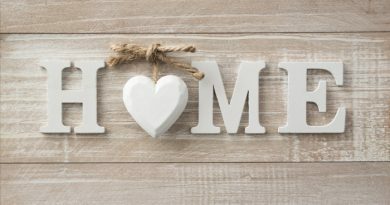 I know, I can hear some of you say “it’s overwhelming to know where to start” or you may say, “I hate to declutter stuff.” Or you may have zero interest in cleaning out any closet, cupboard or dresser drawers. No worries. I remember my great-grandmother taking pieces of fabric from worn out dresses, shirts, and blouses and “piecing” a quilt with the different fabrics. Those quilts continue to be treasured. Donate what can be recycled. You can have a garage sale, sell stuff on Craigslist or Facebook Market Place. You may be able to take some items to a consignment store. This will help your pocketbook and help someone else at the same time to purchase items they couldn’t normally afford to buy. It’s a win-win for everyone. When in doubt about stuff, keep it and wait six months when you have time to purge your house again. I have an extra Bernina sewing machine I bought a few years ago. I won’t sell it because I would be lucky to get pennies on the dollar if I tried to sell it. I am saving it for one of my granddaughters who will get married someday. 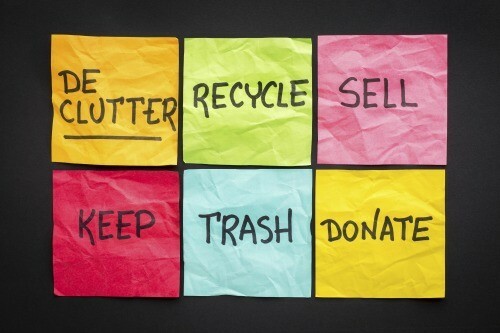 If the item(s) cannot be fixed, repaired, or recycled, place them in your trash can. And don’t look back. Trust me, it’s the greatest feeling in the world. Here’s the deal, there are so many people that could wear those shoes on the shoe racks that you will never wear, those shirts that no longer fit you, or those jackets that would be great for someone else to use. I went with a young girl and she purchased prom shoes and a prom dress at a thrift store. She was thrilled and looked beautiful in that slightly used dress! I was thrilled to hear that P.A.W.S. has a place to donate stuff to help the pets in this world have some money to help them. Yes, I dropped some stuff off today. What a great feeling. 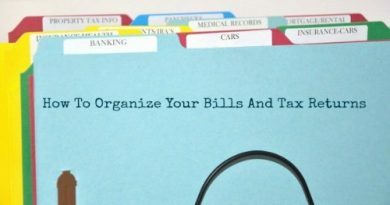 I hope this post helps you declutter stuff that can be used by someone else, give you some extra cash, and feel the joy of living with less stuff. May God bless this world to be prepared for the unexpected. Hi Linda, we must be twins separated at birth! Lol I too love to organize and declutter. It’s a great feeling to have less and to be able to find the things you do have when you need them. Working on one area at a time and getting it organized just makes you want to do more. It doesn’t have to all be done in one day, just keep at it. I’m with you on the kitchen too, must work on that next, gadgets and pans are my downfall. Just how many potato peelers does one need? I should keep one for emergencies and one for a neighbor in need and one for me, right;) Have a great day. No, Rita, we were triplets separated at birth. Lol I believe women always work better together; remember quilting bees & community canning kitchens? When donating don’t forget homeless shelters, especially for warm clothing. And I donate my paperback books to the county jail library – they can’t take hardbacks. I’m sure you know, Linda, quilts should not be stored in any kind of plastic. They should be wrapped in acid-free paper & kept in a blanket chest or cedar chest. Or preferably spread across the foot of a bed so you can enjoy it. I really dislike decluttering! I do, however, love the results. Fortunately, I have a daughter who is a decluttering fool! When I moved into my current apartment three years ago, she was instrumental in downsizing my stuff! Of course, some of that is/was detrimental to my future! I searched and searched for my candy thermometer! Still haven’t found it so I purchased a new one. As for my closet (clothing), I made a pact with myself several years ago that if I purchased something that needed to be hung in my closet, something has to go. I gained two things from this pact. 1) I keep my closet pretty well under control and can use a very small clothes closet and 2) I am much more mindful of what I purchase. Before I did this, I had a tendency to purchase clothing and fill my closet just because I could. Linda, you mentioned a timer. I use a timer as well and some dance music to get me moving FAST! I even use the time when cleaning. One task that I always put off until it took me (it seemed) forever! I hated mopping my kitchen. Now, I have a relatively small kitchen/dining area so it shouldn’t take long should it? But, I found that if I put it off, it does take longer. So, what I did was time myself. I didn’t “deep” clean my kitchen floor but I swept and mopped. It took a whopping 12 minutes! Again, no deep cleaning – I didn’t get on my knees and toothbrush the corners but I also didn’t stick to the floor. I started sweeping and mopping every couple of days (this was when my daughter was young and spilled frequently). No, with just me, the floor doesn’t really need much more that “swiffering” daily but weekly I do sweep and mop.